Have decided to change my Daily car which is currently a 2011 Ford Ka! Its near the end of its life unfortunately and was seeking a bigger car. So had a look at a few 3 series BMW's, Jaguars but just couldn't connect with them... 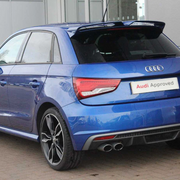 So we went to see this little Audi S1, which okay, isn't much bigger than the Ka! but its different! Edited by MattMacc123, 04 April 2019 - 02:45 PM. 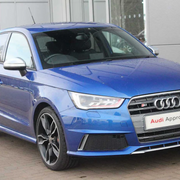 Very smart, a work colleague has an S1 and the noise it makes is nuts. I must admit! was impressed with the noise as well! Thats a cracking little car you have there! You will drive past me when im in the petrol station thats for sure! Is it a little diesel? No it's a 1.25, I think the 0.05 is important, 4cyl petrol. 83 stallions but it's £30 to tax and my old Polo was about to die. In fact it broke down when the dealer tried to move it to the back of the site. Embarrassing. I'm really impressed with the Rio. It's got more kit than my VX or Cayman, it's quiet and comfy and I won't cry if it gets the odd scratch or dent. I thought his S1 was modified but he said they are all the same, popping and banging like a Group B. It's a little licence loser! Edited by pete-r, 04 April 2019 - 03:56 PM. oaft! 83 Ponies, better than my Ka's 67! £30 tax is good! ohh jeez, I had an Audi A2 1.4 tdi a while back 194,000 on the clock, thing died at the side of the A90 on the way to Aberdeen! was absolutely goosed due to a failed turbo! I bet! the wee Kia will be a great wee thing. Yeah i will have to be careful, almost had a heart attack when i noticed that it was electronically limited to 155! in an A1?! :| Couldn't imagine it!